I feel like the on-topic sections were fantastic, but the problem was how sparse those were. I feel like a majority of the text was instead about WWII and the Holocaust. While tangentially related, and certainly needing to be included at some level, I feel like the proportion of its inclusion was very skewed, and felt to me like filler to stretch the book (which ended up pretty short anyway, but clearly the topic at hand was simply not large enough to stand on its own).The writing was a bit formulaic and tedious after a while. Between major events, it felt like a lot of simply listing "then this guy was sentenced and this happened, then this other guy was executed and this happened". It was just choppy and boring and I found myself wanting to skim until I found the next interesting topic.The introduction made a point of saying how no one had written a book on this specific topic before. After reading it, it's pretty clear why. Perhaps it's better served within a wider survey of capital punishment so you can remove the filler. There is a lot of good history and stories in this book including pictures of the original execution chambers, wardens, scientist, and the whole original patent of the Easton Co. gas chamber made for Colorado DOC. There is also just the right amount of science in this book for you to be able to process the chemical reactions that cause sickness and fatality. The problem with this book is that it contains a massive political slant that was really annoying and almost intolerable. It goes off on a tangent sometimes into areas not pertinent and irrelevant to the story. It really ruined a lot of the enjoyment for me. 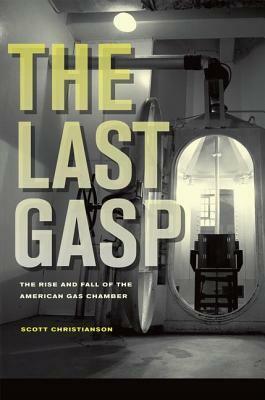 “The earliest gas chamber for execution purposes was constructed in the Nevada State Penitentiary at Carson City and first employed on February 8, 1924 . . . the first execution by gas arose as a byproduct of chemical warfare research conducted by the U. S. Army’s Chemical Warfare Service and the chemical industry during the First World War . . .”From the advantage of current access to court cases and other documents, Scott Christianson has compiled a weighty tome devoted to the history of the Gas Chamber. The book is heavily referenced and authoritative. Christiansons’ background as an investigative reporter and historian uniquely qualifies him to take on this subject. Personal and political ties influenced many decisions in regard to the development and use of deadly chemicals. In his detailed account, names are named and you will recognize them.In the early 1900s, racism was pervasive. Immigrants were viewed with suspicion. Many prominent persons believed the defective and unfit did not deserve to live and certainly not to reproduce.“If I had my way, I would build a lethal chamber as big as the Crystal Palace, with a military band playing softly, and a Cinematograph working brightly, and then I’d go out in back streets and main streets and bring them all in, all the sick . . . the maimed; I would lead them gently, and they would smile a weary thanks.” ---D. H. Lawrence. German troops introduced chemical warfare in 1915. It had the advantage of rendering a battlefield uninhabitable, but the greatest impact was psychological. Before WWI the use of gases was considered dishonorable under the rules of warfare, but after the German’s use of it the Allies decided that “there was no choice on their part and that they had to retaliate in like manner.” In secret, America’s chemists rushed to catch up to Germany’s chemical development. They tested more than 1600 compounds on mice, rats, dogs, and other animals, as well as on American soldiers.After the war, the powerful chemical lobby wanted to keep the gas technology they had developed, but turn it into “constructive peacetime uses.” Scientists were testing poisons to fight fires, make dyes, exterminate insects and animals, make fertilizers, to fumigate ships in all of America’s ports, and to fumigate fruits and other foods. It was used in the miningindustry to separate silver, gold, copper, lead, and other ores. Claims were even made that poison gases could rid the world of cancer and other dreaded diseases. In 1921 Nevada enacted the Humane Execution Law and became the first state in the world to require the administration of lethal gas to legally end human life. The news of the first two executions flashed around the world. Other states followed Nevada’s lead. But in harmony with the eugenics of the time, it was often the poor, the mentally handicapped, and minorities who were killed.“Hitler’s concept of concentration camps as well as the practicality of genocide owed, so he claims, to his studies or English and United States history.”I was amazed at the degree that American financiers bankrolled fascist regimes in WWII, as well as the secret alliances of prominent men that were hidden through a web of trade agreements. They are named in this book and referenced, and I congratulate Christianson for his thoroughness in following the paper trail.At the advent of America’s entry into WWII many feared Germany’s use of chemical warfare again. Winston Churchill stated, “The only reason they have not used it against us is that they fear the retaliation.”“Hitler used the press of war to secretly authorize a euthanasia program that at first was ostensibly limited to eliminating an incurable sick patient . . . “Hitler emptied the mental hospitals in his ‘mercy killings’, and upon public outcry, the euthanasia action secretly shifted to concentration camps. Christianson lists these camps and their methods in stark detail.“The word went out . . . about the immense scope of the genocide. Yet nobody noted that it been the United States Army and American scientists, industrialist and politicians who had invented the gas chamber in the first place . . . Nobody stated the lamentable fact that the radical eugenicists and racial supremacists seemed to have gotten what they had wished for.”“Pursuing this haunted path has brought great sadness; my battered heart grieves in the memory of those lost.” ----author Scott ChristiansonThis book is fascinating yet brutal. He spares no detail in the descriptions of just how these chemicals work, and his history proceeds seamlessly from early development to current uses of these poisons. He combines history and science, as well as legal reasoning with humanitarian concerns. It's not a happy read, but one that reveals a relatively unknown part of modern history. A valuable contribution to the debate on capital punishment. Puts the use of the gas chamber as a means of execution into it's historical context and it's not a pretty story.It's a speicialist subject no doubt but I had never realized the links with Eugenics and also the holocaust. Sometimes these are little stretched to be honest, but they do make the context of the gas chamber a more thought provoking read.It's clear that such executions are not humane despite that being the rationale behind their use and we should be thankful this method seems consigned to history now. We need to learn the lessons that led to its employment. This book is very dry. I tried to read it once before and got stymied, and this time I basically read the chapters that were about the gas chamber executions of individuals that I was familiar with, Bonnie Heady, Carl Hall, Caryl Chessman, Barbara Graham, Robert Alton Harris, Leandress Riley, and so forth.This would definitely be a great resource for someone working on a research paper/thesis about capital punishment. #NCOwn in hardback.FS: "The huge literature about the Holocaust has assumed that, in the words of one leading historian, The creation of the gas chamber was a unique invention of Nazi Germany. "LS: "But its awful legacy will continue for a long time to come." This is an amazing book! It is very dry, and I read it over the course of a week or two on and off because it is so dry. However, since I took my time and did not rush the read, I really enjoyed what Scott has to share with us. The author states that he was not going into the sociological aspects of the gas chamber, but its inclusion might have made the book a bit more interesting. Still, it was a good read on the history of the gas chamber as a capital punishment if not a bit dry. It was okay, but not well-written in spots. Large spots.